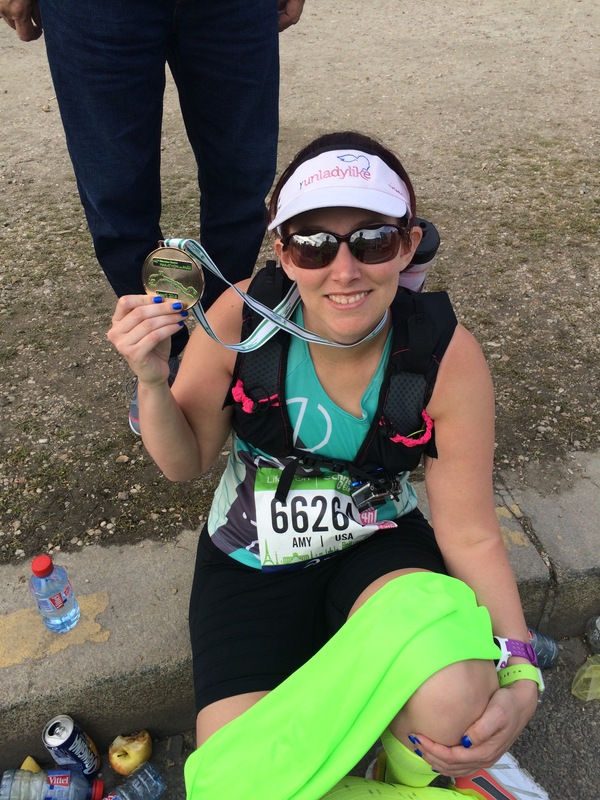 So I disappeared for a while, I got injured, took a week off, got better, ran a couple half marathons, lost all running mojo, didn’t run over 16 miles after my injury (seriously) and really had no idea what to expect for this marathon. So my longest run this training cycle was 18 miles in January. And for the record that was not what my training plan said to do. We arrived in Paris Wednesday morning on a red eye flight. Sarah was joining me for this adventure and my parents came along for Paris and Vienna. I’m going to save all the sight seeing for other posts (hopefully). We headed to the expo on Thursday since we heard the lines could be bad on other days. 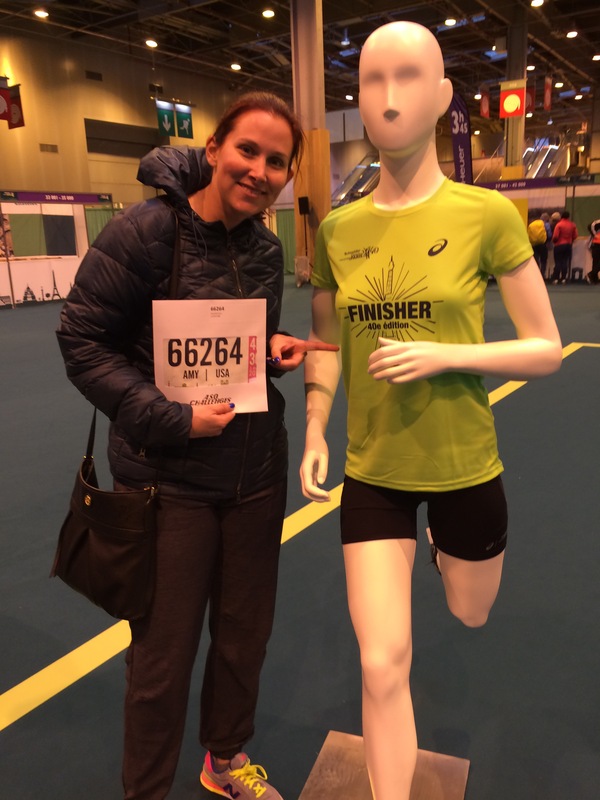 We headed straight in to the building, first stop is to turn in the medical form (your doctor has to sign a form saying you’re physically cleared to run the race), then you pick up your bib. 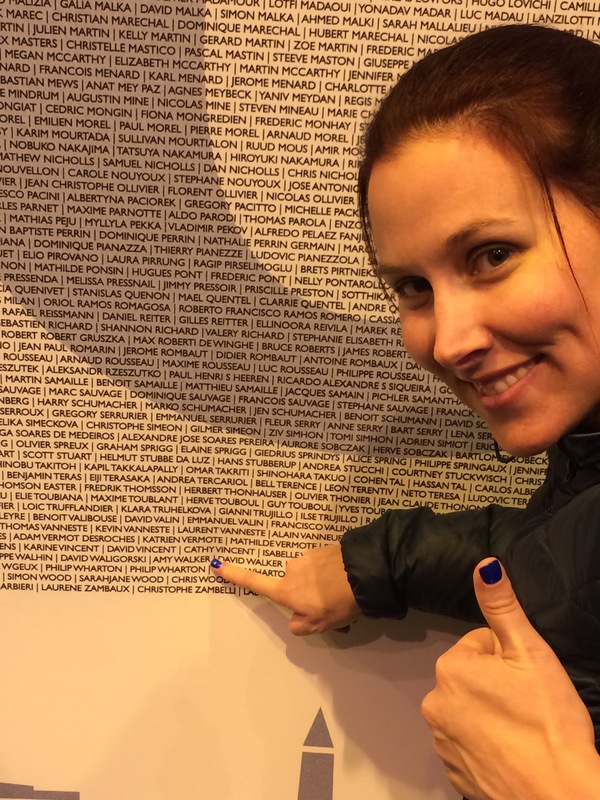 After that I snapped some pics with the race shirt in case I didn’t finish the race (you only get it if you finish) and found my name among 57,000 on the wall. After that you can make your way through the expo and pick up your swag bag. Asics is a big sponsor so they had a huge booth with all the race merchandise. I snagged a shirt and magnet and then we headed into the main expo. It was interesting to see all the European brands mixed in with popular American brands. I tried on the new Hoka Claytons and I think I might pick up a pair to try for speed work and shorter races. Fast forward to Saturday, I was trying to figure out what I was going to do for dinner. I didn’t really want to deal with finding a restaurant that would work so I decided to order in room dining. The hotel workers thought I was crazy but they took good care of me with my plain grilled chicken, white basmati rice and potatoes (those potatoes were so good). I set everything out the night before and did two sessions on the Normatec boots (yes I carried these through Europe). 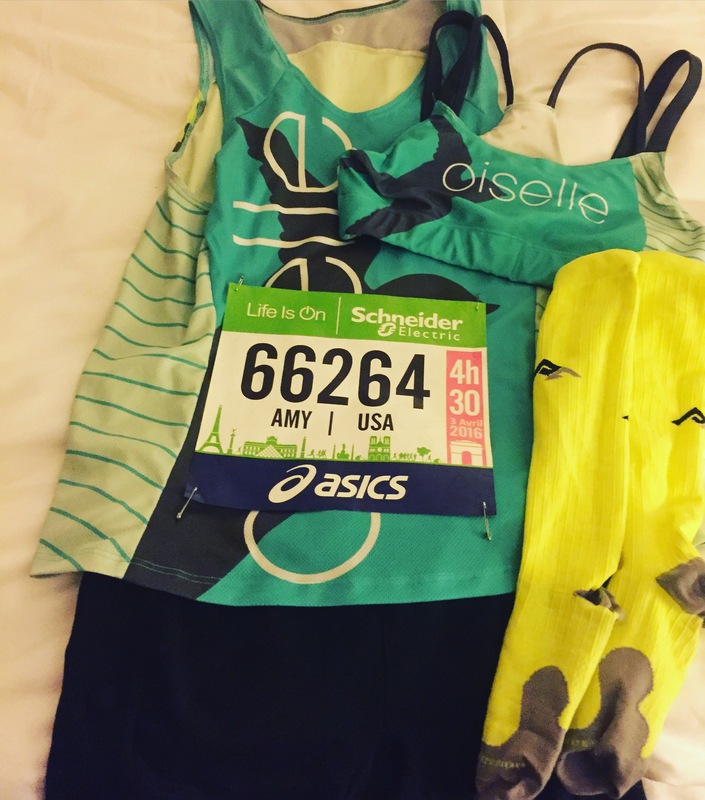 My mindset going into this race was pretty much try to finish, it was going to be hot, so I just wanted to make it to the Eiffel Tower (mile 18ish) and then try to stay in front of the sweepers. 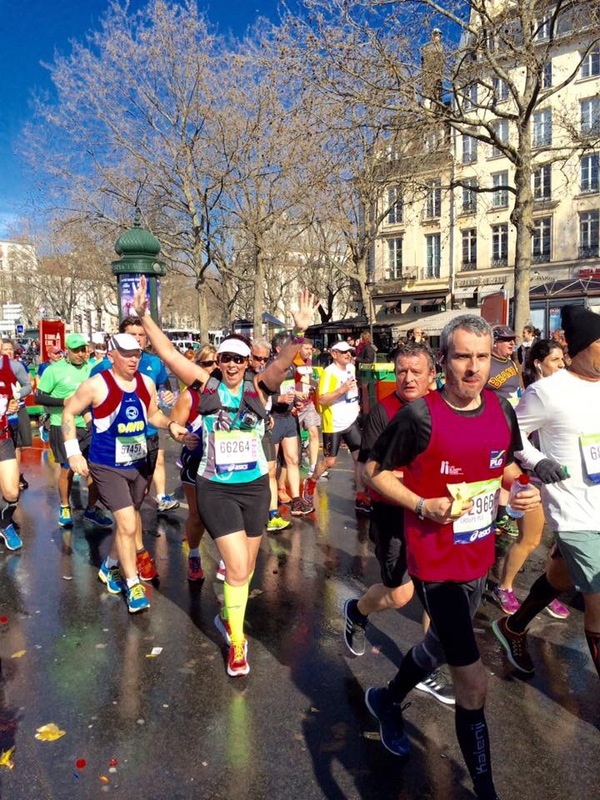 The Paris Marathon website was pretty adamant about a 5:40 time cut off and to be totally honest I wasn’t sure I could get to that. I thought I would be close but with the temperature and my late start I didn’t know how my body would respond. The race has a later start (8:30) and then has a ton of corrals with 15 min between each corral start so my start time wasn’t until 10:15. We got to sleep in a little bit, and I ordered my room service breakfast (which was an interesting experience) and took my time getting ready. Sarah was two waves ahead of me so she left before I did. My parents came with me to the start, which was nice to have them around. I found the large amount of port a potties and hopped in line. So they’re different in Europe, you have to use this plunger type thing to flush it and in the corrals they had urinals, 4 in a circle, so strange! 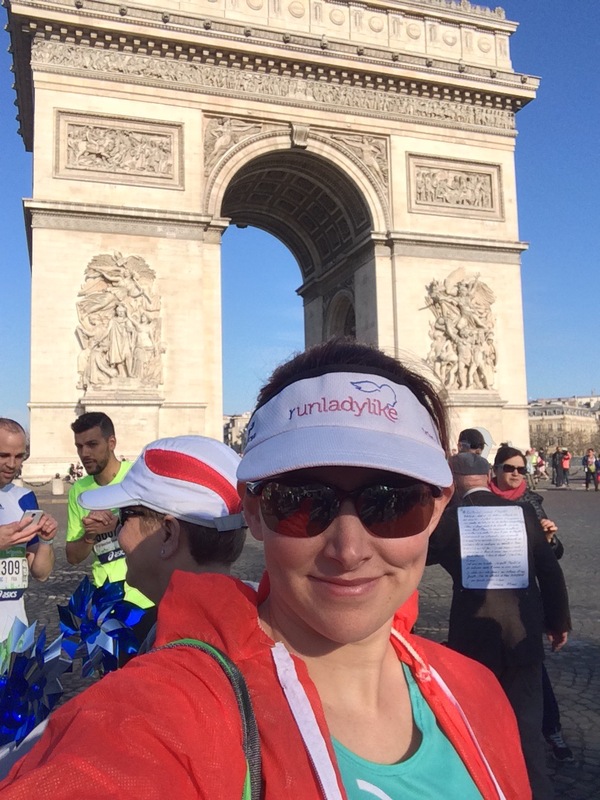 After the pit stop, we walked towards the start area and snapped some pics at the Arc De Triomphe. The start area was on the Champs-Élysées with all the fancy shops around, I wish I could have done a little shopping but they were all closed. I said bye to my parents and made my way into the corral. It was jam packed and I worked my way towards the middle. After a little bit we made our way forward and then started down the road. The first bit is downhill and I felt decent. But by mile 3 I was sweating a ton and knew I needed to reign it in and hydrate better. Right after the first 5k I spotted my parents by the Bastille monument. By the pictures you can see how excited I was to see them. After this point I could tell it was going to be a long day and I needed to come up with a survival plan to combat the heat and humidity (93% at the start). I started taking salt pills earlier and at one point I took two instead of one. I also started grabbing water bottles (no cups in Paris) and pouring water over my head and down my shirt to cool myself. Apparently I can’t read elevation maps well or I just run on super flat trails because this course was much hillier than I anticipated. By mile 8 I knew I had to start walking the hills but the problem was they were mile long hills. So I would run to keep my pace reasonable and when I felt like I could walk faster then run, I walked. And this is where I started to not feel great and knew my body was overheating. It was also the middle of the day by now and not much shade on the course. We were weaving through neighborhoods and through the zoo area. It was nice green space but not many spectators, except when we ran through a large parking lot. I really just wanted to get to the halfway point and knew my parents weren’t too far past that. I spotted my parents from 100 ft away and I must have lighted up because a spectator made a comment about how happy I looked (if she only knew). I headed over to them and switched out my empty water bottle for a full one. I told them it’s been a rough day and I wanted to quit but that I was going to keep going. They gave me a pep talk and I headed on my way. After the turn near Bastille we were running along the river, which was flat. This helped me a little bit as did the tunnels. The only bad thing was coming out of the tunnels. So I ran the flats and downhills and walked the uphills. This part wasn’t terrible and it helped cool me down. After 4 miles of this we were getting closer to the Eiffel Tower and it must have cooled off slightly or the humidity went down. Once I saw the Eiffel Tower I started feeling better and some good songs came on my playlist. I started running a little faster and was singing songs out loud, seriously. I’m sure a lot of the people had no idea what I was saying (and I got some funny looks) but this was helping to keep me moving for two miles. Around mile 20 someone had put a picture of the wall with a sign to break through it (it was on the side of the course so not literally). I was trying to keep my momentum going but my body was pretty exhausted since I wasn’t properly trained. I knew we were heading towards some of the bigger hills on the course (they weren’t terrible) and I just wanted to keep moving. I was really glad I started to feel better from the heat. I continued my run/walk and wasn’t sure if there was going to be a sweeper bus that would pull me off the course. There had already been a lot of ambulances going by so I knew I wasn’t alone in my heat struggles. Once I made the turn into the park I knew I was getting closer. There were a few more spectators but a lot were packing up. The park was pretty boring and had a few hills. I stopped to stretch a couple times and had to make sure not to look too deep into trees because quite a few guys were stopping for bathroom breaks, some that were not standing up (so gross). The park felt like forever but eventually we turned out of it and I knew the finish had to be close. However I couldn’t see the finish and my watch was off but I just took off hoping the finish was nearby. I went through a roundabout and there was the finish! 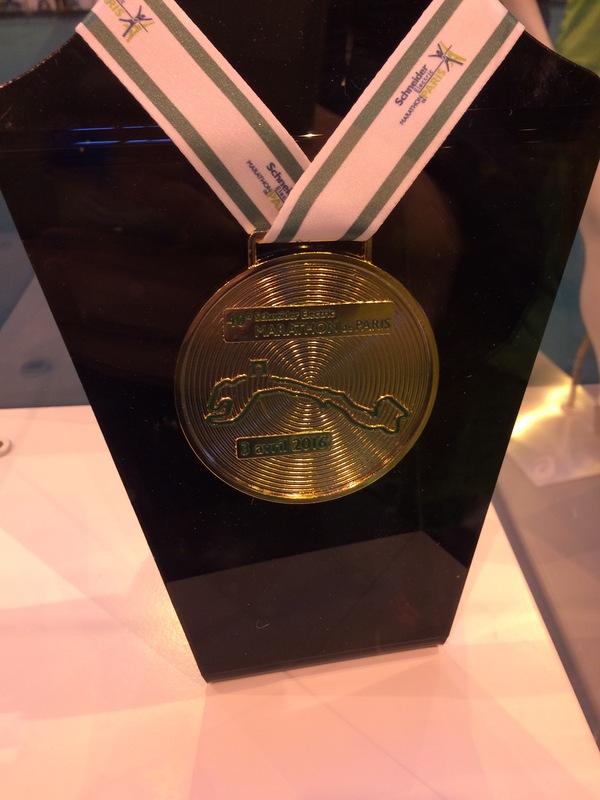 Thankfully I was an “official” finisher and received my shirt and medal! I finished in 5:57:47, not my fastest but not my slowest. I’m happy with how it went considering I didn’t slow down my sightseeing in the days before the race and it was HOT. Plus I was undertrained and had really no motivation to run this race. And for now I take some time off the marathon, potentially for good, but at least for a year. I have sinus surgery in May that will keep me from exercising for two weeks so after that I’ll start running 5ks and 10ks and get ready for some fall half marathons. 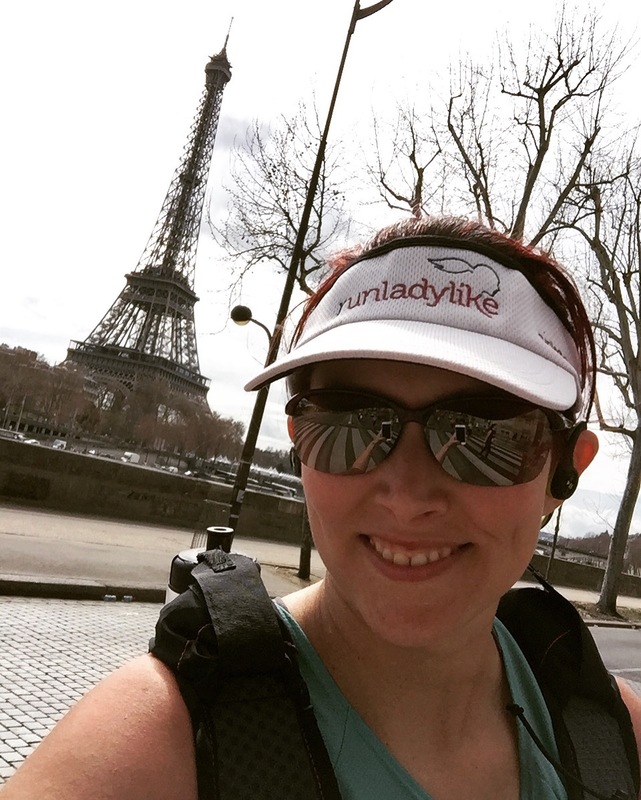 I definitely recommend the Paris Marathon for a fun destination race! There are some differences to American races but overall I was pleased with the organization. Such strong selfie game, always! Great recap. 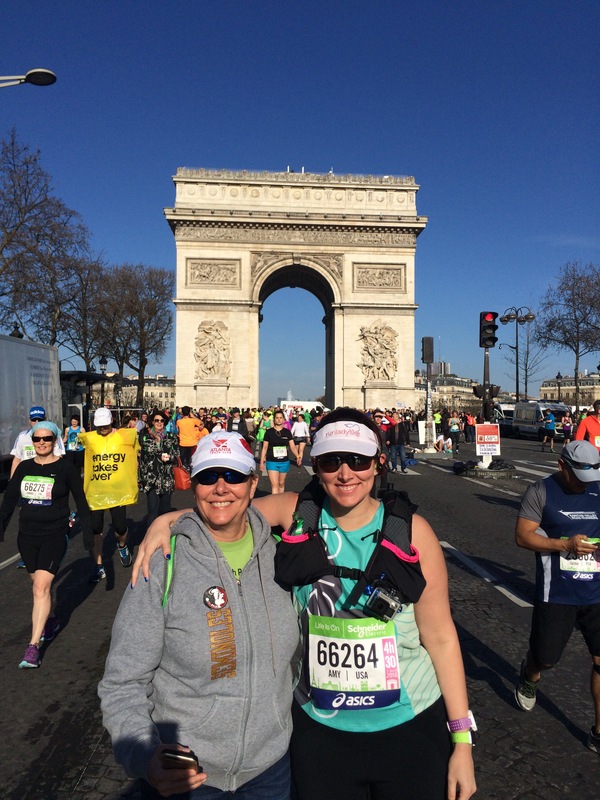 It was so fun running a marathon in Paris with you, even if neither of us were particularly well trained.